A Siege Battalion Trooper is a minifigure replica of the 442nd Siege Battalion trooper from the Star Wars Revenge of the Sith. It was released in 2005 as part of the Revenge of the Sith line, although these troopers were never actually seen in the movie at all. They are Clone Troopers in standard Phase II armor with green markings. This minifigure makes an appearance in two of the four LEGO Star Wars video games. The Siege Battalion Trooper's appearance is based of that of a clone trooper from Episode III in phase two armor, with green markings. His torso is coloured to resemble white battle armor, he has white arms, white legs, a black hip, black hands, and a fully black minifigure head. He comes with an exclusive Phase II clone helmet. It contains an almost T shaped visor, which is black, empty and has two filtration holes. The trooper has green "V"-shaped markings on top of helmet and on the torso. He is part of the 442nd Siege Battalion which is a part of the 7th Sky Corps. His armour resembles a 212th Trooper with light green markings instead of the usual yellow-orange. The Siege Battalion Trooper is exclusive to the set 7260 Wookiee Catamaran, which was released in 2005 as part of the Revenge of the Sith line. Two Siege Battalion Troopers were included, each with a blaster. They came with a swamp speeder. He is also included with Anakin Skywalker and Yoda in the 4269244 Yoda Magnet Set from 2006. Siege Battalion troopers appeared in LEGO Star Wars: The Video Game and later LEGO Star Wars: The Complete Saga. They appeared in both games in the same level, which is Defense of Kashyyyk. In this level, the player takes the role of Yoda and Chewbacca, and Order 66 has been initiated. Therefore, the Siege Battalion troops turn against Yoda and his Wookiee partner. In the level, these troopers serve as the most seen enemies, along with Battle Droids. These clones can be later bought from the in-game store and played as. Before the player can purchase them, one must unlock them. The trooper in LEGO Star Wars: The Video Game has blue markings instead of green, even though its HUD Character Portrait shows it with green markings. 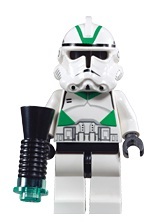 In LEGO Star Wars: The Complete Saga the markings are converted to green, although both blue and green marked helmets and torsos are available for customization at the Cattina. Although the Siege Battalion Troopers look exactly identical to their in-game counterparts, in-game, they are named "Clone Trooper (Ep.III)(Swamp)". Facts about "Siege Battalion Trooper"
This page was last edited on 10 January 2016, at 00:31.